Among the tasks the Disk Cleanup tool can provide are removing temporary files, emptying the recycle bin, and deleting installed programs and downloaded files that you no longer use. For example, each time you visit a web page your browser stores temporary internet files related to that page in order to access the page faster the next time you visit. Over time, however, this can take up a large amount of disk space which is why Disk Cleanup is a great tool to use to regain this lost hard drive space. Here are the steps to using the Disk Cleanup tool on computers running any version of Windows 7. Click Start > All Programs > Accessories >System Tools, and then select Disk Cleanup. You may be prompted to select which drive you want to clean (if you have multiple drives). Disk Cleanup will calculate how much space you can free up. 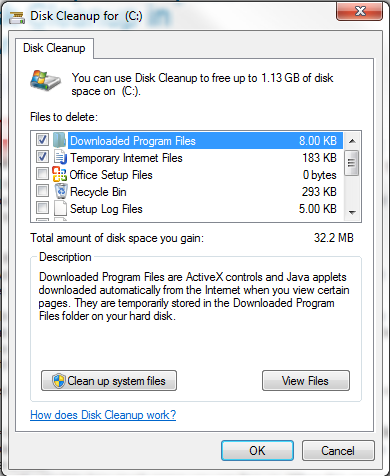 Windows 7 Disk Cleanup first calculates how much space it can free. When the disk analysis process is complete, browse through the list of Files to delete. Uncheck any files that you DO NOT wish to remove from your computer. Click OK. Disk Cleanup will present a list of files it can delete to free space. For more options, such as cleaning up System Restore and Shadow copy files, under Description, click Clean up system files, and then click the More Options tab. Select Yes when prompted to confirm that you want to delete the specified files. Allow a few minutes for the removal process to complete. That’s all! Now your computer has a cleaner hard drive, and you may even experience better performance and speed! Just be sure to remember to perform this cleanup on a regular basis and you’ll help keep your PC in top shape. After a few minutes, the process completes and the Disk Cleanup dialog box closes, leaving your computer cleaner, performing better, and potentially increasing your PC speed. If you would rather automate the process of performing Windows Disk Cleanup, sign up for Free Computer Maintenance.